Representatives of 10 countries in the WHO European and Eastern Mediterranean regions participated in an executive course on global health diplomacy, exploring common interests in health as a foreign policy issue and illustrating how countries have collaborated at the national and regional levels for global health. 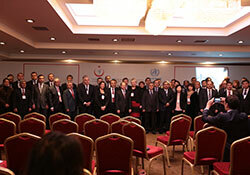 The course was held in Ankara, Turkey on 26–30 November 2012. The course was jointly organized by the Ministry of Health of Turkey, WHO/Europe and the Global Health Programme at the Graduate Institute of International and Development Studies in Geneva, Switzerland. Participants included diplomatic and health professionals from Azerbaijan, Egypt, Kazakhstan, Kyrgyzstan, Libya, the Sudan, Tajikistan, Turkey (host), Turkmenistan and Uzbekistan. Professor Kickbusch was joined by senior experts including Professor Michel Kazatchkine, the United Nations Secretary-General’s Special Envoy on HIV/AIDS in Europe and Central Asia; and Dr Mihály Kökény, Lecturer, University of Debrecen, Hungary. Honorary and guest speakers included Ambassador Jean-Maurice Ripert, Head, Delegation of the European Union to Turkey; Mr Shahid Najam, United Nations Resident Coordinator and United Nations Development Programme (UNDP) Resident Representative in Turkey; Ms Ebru Ekeman, Counsellor, Permanent Mission of Turkey to the United Nations Office and other International Organizations in Geneva; Dr Serdar Çam, President, Turkish International Cooperation and Development Agency (TIKA); and Professor Dr Mustafa Sıtkı Bilgin, Head, Department of International Relations, Yıldırım Beyazıt University, Turkey. The course is part of an initiative to build capacity in global health diplomacy in the countries in the WHO European Region, as proposed in WHO Regional Committee for Europe resolution EUR/RC60/R6. This course, the third held in Europe, is part of the follow-up process. The first was organized for WHO staff in Copenhagen, Denmark in April 2012, and the second, for representatives of Member States in the South-East Europe Health Network at the end of August in Debrecen, Hungary. The course focused on health diplomacy as it relates to health issues that transcend national boundaries. It discussed the challenges ahead and how they are being addressed by different stakeholders and at different levels of governance. Negotiations on health-related international instruments and mechanisms, as well as the global response to new infectious diseases, provided the real-life backdrop for the discussions. capacity for global health diplomacy.